Do you remember last summer (August) when I told you about my taping on The Quilt Show? It was a great experience, to hang out with Ricky Tims, Alex Anderson, and 50 audience members (including two Canadians). I showed them my Mock Mola Applique technique, as well as designing with Notan: Exploding the Square. John and I sang a few songs, and generally had a wonderful time. I have just received the news that my episode 1204 is going to be broadcast on February 11th! You can see the promo for the show here. In honour of this very exciting news, I’ve decided to share my happiness with you. 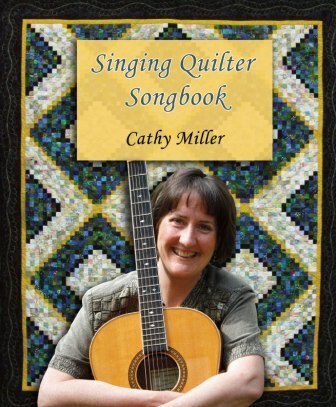 From now until the end of February, if you order the Singing Quilter Songbook I will ship it to you for FREE! (that’s a savings of between 17%-40%, depending on where you live). To order this and take advantage of the deal, visit the website. There are links on the main page. This offer is only good till the end of of February, so don’t delay! And – enjoy The Quilt Show. Hello everyone, from Brisbane. We are back in the “civilized” area – back on the bitumen, as they say here (on the paved roads). Yesterday we drove through what I hope are the last non-hexagon friendly roads (lots of bumps and potholes and construction/road works) on this trip. There has been so much rain and flooding in the entire state that the RCI (road comfort index – I live with a road engineer!) is shocking. We saw whole bridges that had their footings knocked out by the floods, closed and awaiting re-building. But we also saw lots of boab trees and emus along the way, and it makes me wonder why it has taken us so long to get in from the coast and explore. We’ll be back again someday. 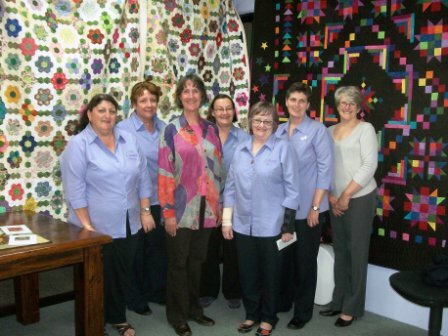 Our destination was Gatton, home of Sew Creative quilt shop and Ground Zero for the World’s Biggest Hexagon quilt. Remember last year when we stopped by, I interviewed Gail Chalker and the gals there who worked so hard to create this quilt? They gave me a piece of it (#100/115), hoping that I would write a song about it. I don’t usually need to be given a quilt to write a song; this was very persuasive! They asked us to come and give a concert in the shop. 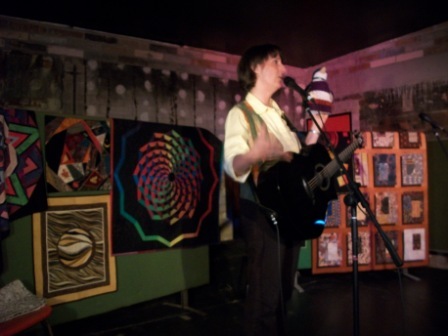 Can you read the line on the poster: “Debuting her song ‘The World’s Biggest Hexagon Quilt'”? She had this printed before I wrote it!!! (No pressure…..). If you’ve been following this blog for a while, I have mentioned this song before. During this tour I have been singing snippets of the song, just so I could practice a bit before the big night. I am happy to tell you it went very well! 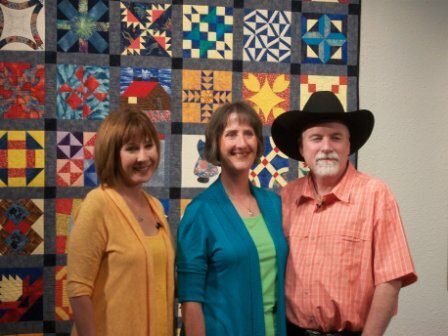 We had about 30 quilters attend, and I was delighted to see 3 of the 6 remaining pieces of The Quilt were to be our backdrop for the show. There’s a reason to do all you can do. What do you do with the biggest quilt when the show is over? Nothing like this quilt to help you face the day. Afterwards, I spoke with some of the women who had contributed so many hours of time and handwork to make the quilt a reality. 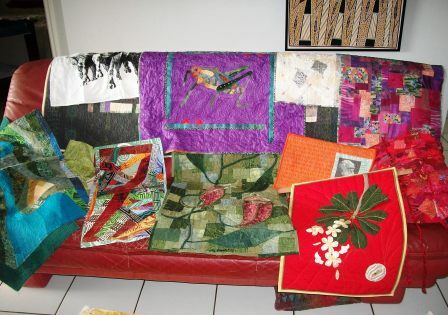 They have since moved on to other projects that Gail has talked them into: flood quilts and pillowcases. She tells me she’s got an idea for a new project, but wouldn’t tell me what it was. I guess we’ll all have to wait to see. As always, there was a door prize at the end of the evening. This time it was a very special one: I pulled the ticket, and here is the winner, with her very own piece of the WBHQ. What a great door prize! We had a great evening with the gals from Gatton. Today we drove into Brisbane and did a house concert for our friend Jan Rhoades. Several of the audience members had contributed hexagon rosettes for the quilt. One of them looked closely at my piece and SHE RECOGNIZED SOME OF THE ROSETTES SHE SEWED! Lois shows me her two rosettes on my quilt. What are the chances of that!?!?! The quilt has 153,000 hexagons in it, and was huge. I’m delighted to have met one of the people who helped to make my part of the quilt. 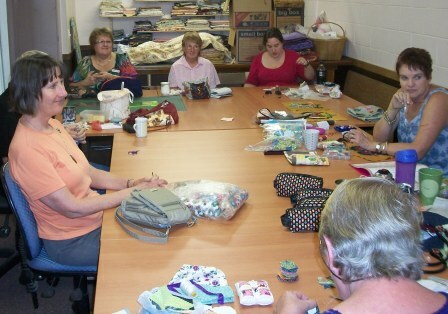 Here are the gals at Sew Creative in Gatton, after the show last night. 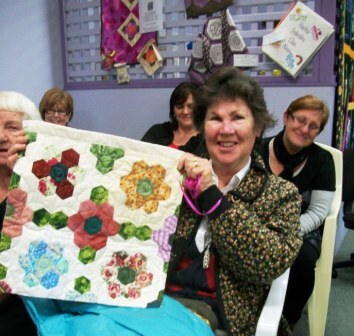 What a great bunch they are – they make all us quilters proud. Veronica, Janelle, me, Lyn (who did all the long arm quilting), Gail, Jenny and Trish. If you’re ever driving through Gatton, Queensland, stop by at the shop and have a cuppa and a bikkie. You won’t be sorry. And please say hello from me. This is our first day of performing at the European Patchwork show in Alsace. We have arrived in a beautiful part of the country – mountains, gardens, and quilters. What could be better? We got here yesterday, after having spent the night in Nancy. The last part of the drive presents a choice: up and over the mountain, via twisty-windy road, or THROUGH the mountain in a straight tunnel for about 5 km. We took the latter, paid our 7 euros and turned our car lights on. I’m always amazed at the work involved in such an endeavour. There are frequent fans, lights, and hidey-holes in case of emergency in this tunnel, and it all seems very well thought out. We emerged to a narrow valley with an alpine flair. The houses are quaint, with louvers on all the windows. The roads are small and twist and turn between them. None go in straight lines, like you see in more modern, flat cities. The villages have evolved before automobiles, and the cars just have to deal with it. Parking is wherever you can, sometimes even on sidewalks. I am impressed by a few things already: everyone here seems to have a dog, and they meet their friends and neighbours in the daily dog-walk. Everyone also seems to have a beautiful garden. Here, there are many vegetable gardens, lovingly tended, and, at this time of year, huge and productive. There are apples in all the apple trees, ripe and falling to the ground. We have set up our show at the hall here in St. Croix aux Mines. The show is held in many locations in four communities in the valley. We, like all the other attendees, shall travel from place to place using the shuttle service, which will alleviate the stress of trying to find parking. 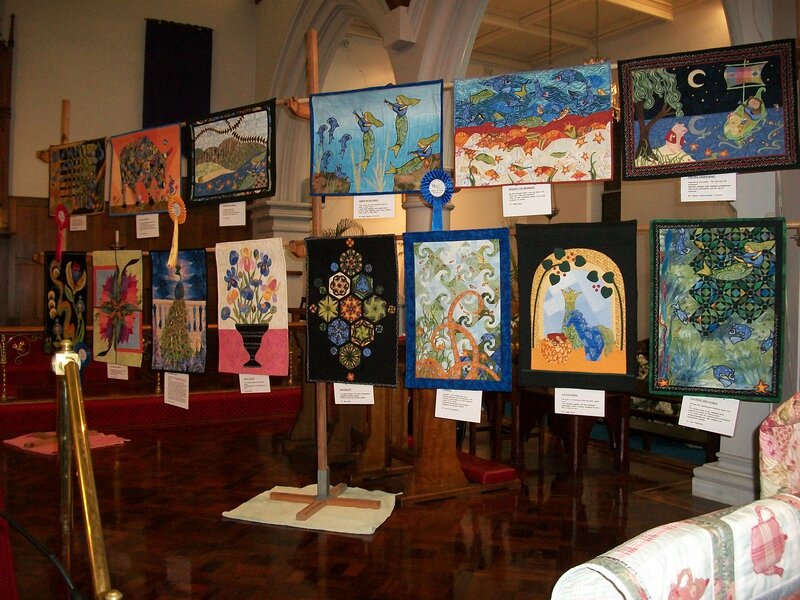 Our hall also has a few displays of quilts, including an Australian collection by our friend Annette Gero. We saw her yesterday, at setup. 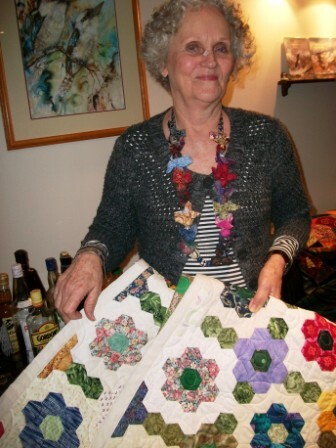 She has brought some of her waggas and medallion quilts and will be giving a talk on the collection at some point. The organizers have created our concert space with black-covered particle board. There are lights and sound and 100 chairs for our audience. We will be giving two hour-long concerts each of the four days of the exposition. We are hoping for good audiences, and have been told to expect full houses throughout. After our setup yesterday we headed down to Ste Marie aux Mines to do some shopping, check our email and see some of the rest of the setup. There is a huge vendors’ area (outside under tents as well as indoors) and everyone was setting up their wares. Lots of traditional country-style stuff, but also quite a bit of art quilting supplies, including dyes, embellishments and hand-dyed fabrics. I’m hoping for some time to look through when everyone is open and see what I can find! There are well over 20 locations to this quilt festival, and I know I’m not going to get to see it all. The most of our day will be taken up with our own work, but I’m hoping to slip away to see the Ralli quilts from India at some point. The weather is stunning – clear air, temperatures sitting around 23C, and perfectly sunny today. Autumn in France! And now – to do half my show “en français”. Wish me luck!!! This is what I will be seeing from the stage. Yesterday we sent the songbook in to the printers. Now we wait. The second book was going to be a collection of all the stories people have told me after shows, and via email and snail mail over the years. I have already written the song called “100 Ways to Hide Your Stash”, but many, many people have told me, since I wrote it, of all the OTHER places that I missed in the song! 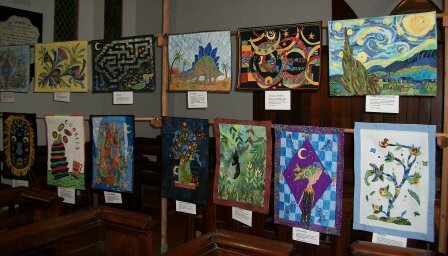 There are lots of stories of charity quilts – I’ve already written the song “A Quilter’s Embrace”, but these other stories needed, I thought, a venue. It would be a “bathroom” kinda book, small, but with lots of graphics and snippets, like a crazy quilt or confetti quilt. But then I thought: I’m a songwriter. I should be doing a songbook! I have friends who have done songbooks, and Jack Cole loaned me his copy of the new James Gordon songbook, complete with interview of Himself about how he writes, etc. THAT’S IT! sez I. I’ll do an “enhanced” songbook (because I don’t think quilters are going to buy a book with just sheet music either. I have sold some individual sheet music to people over the years – not much, but some). So began the work. I enlisted the help of my friend, producer Paul Mills to design the book. He suggested I synchronize with his music writing program, Finale. First, I had to learn how to use it, which took a while. By January, I had all 70 songs scored. Happily, the program plays back the music you have scored, so it’s fairly easy to spot the mistakes. I sent it all to Paul. I thought the biggest job was going to be scoring the music. Whew! Finished! But wait…..
Then I had to write the rest of it. I had all the lyrics already in proofread form, thanks to the CD artwork. Another big job done! But the stories still had to be written. And this was the most important part of the book for me. The history tales have evolved over the years. The “Rajah Quilt” story, for example, has been enhanced for me by having met descendants of Elizabeth Fry, and having sung the song in a church that looked out on the grounds where the women (and their babies) were buried in Hobart, Tasmania. The Changi Prison song “Time Flies” means so much more to me, now that I’ve met Freddy Bloom’s daughter, Ginny, in England and found out Freddy died 4 months before I wrote the song. These events happened because I wrote the songs. I feel I could write a book about these two songs alone. In our travels, we’ve chased up more of these stories: visited William Driver’s idiosyncratic grave in Nashville TN (from the song “Old Glory”), met Vickie Lopresti who made a quilt based on the song “The Trapper and His Bride” – and got a blue ribbon for it! 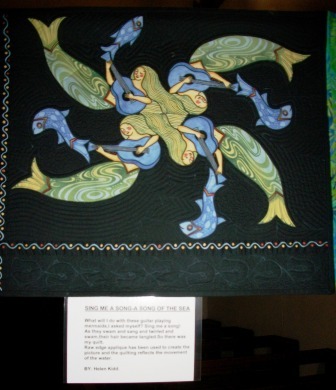 I’ve also seen the magnificent “Duck Neck Quilt” in Skagway, Alaska, and performed (in June 2011) at the Panguitch Quilt Walk Festival. Surely that’s the bulk of the job done? Then Paul started sending files back to me for proofreading…. Throughout the tour to Australia/New Zealand and the southern US, I received files from him that kept getting bigger and bigger. The list of edits seemed to never get smaller. Every time I found the time to read through the book and send him corrections, he got them back to me so quickly that I had to start again. It seemed never-ending. The final step was to enlist my friend Bob deWolff to proofread the music – again – but with fresh eyes. He caught a few more things, which was good. Another friend, Wendy Wetzel helped out by suggesting a better way to describe one of the patterns in the book: the Quilter’s Delight (a great way to do Drunkard’s Path). FINALLY we’re done, and it’s been sent to the printer. One more read-through of their proof, and then we wait for the boxes. I expect to receive them in early September. My friend Carol Noel (who is also a musician and book designer) tells me to make sure, when I open the first box, that I smell the new books. I guess there’s a particular smell to freshly-printed books. There’s no equivalent with receiving the first box of CDs. I’m glad she told me about it. The book will be 148 pages, and will include complete scores, melodies, lyrics and chords. PLUS photographs and stories. PLUS snippets from 11 years of travelling in quilting circles. PLUS a few patterns. A Time Line and complete index. I couldn’t have done this without the great work of Paul Mills, who made the time for it between recording projects and computer crashes (thank goodness for his obsessive backing up of files!!). I’ve learned a lot during this process. I’ll probably do another book at some point, but for now, I’ll take a break. It’s time to get back to quilting!! You’ll be able to order your copy soon. Maybe wait till we have them in our hands – only then will I believe it’s true! We had a great time in Ipswich last night. We were in a 150 year old Anglican church – the oldest Anglican church in Queensland. It exuded history, located in a largish country town (smallish country city?) where they know how to be friendly, inclusive and welcoming. We were supposed to be a part of the Ipswich Festival, but because of the Queensland floods which significantly affected the town, the festival has been moved to May 18-29. That they went ahead anyway with our concert was impressive. 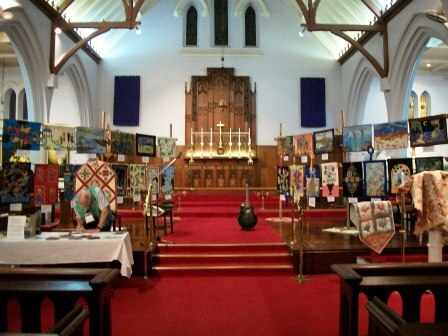 Instead of all the quilts they normally have hung all around the church, they organized to have a display of the newly-judged Queensland Quilters Challenge quilts for everyone to see, and they were magnificent! 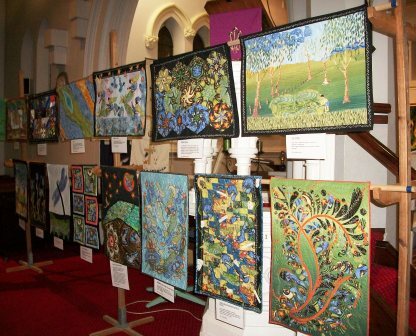 Although there were quite a few “non-quilters” there last night, everyone seemed to enjoy the show. The evening started with a wine and cheese, and everyone stayed afterwards for our concert, which was a good sign. We had over a hundred people! Kudos to Verna and the rest of the Craft group for great organization and ticket sales. 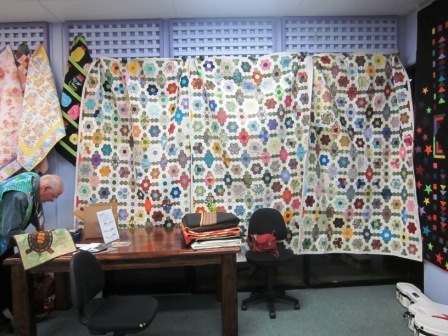 On our way back to Brisbane today, we stopped by the SE Queensland SCQuilters get together. This is the on-line Australia/New Zealand quilting discussion group I belong to. There are well over 2000 members, and there are local GTGs all over the country. I’ve never been to this one before, and it was great to put faces to some familiar names. 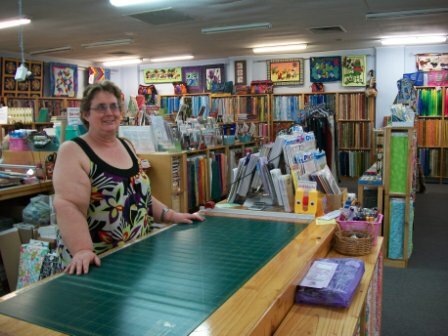 I got a chance to get some 1/4″ hexes done too, which was great – the roads here haven’t been very conducive to sewing…..
We have visited a wonderful quilt shop in the Top End – Dragonfly Fabrics. If you collect Australiana, Aboriginal, Jinny Beyer, dragonfly, landscape, frog or Kaffe Fassett fabrics (plus a LOT more) this is the place for you! I even found one with snow skiers on it (and we’re a LONG way from snow here!) 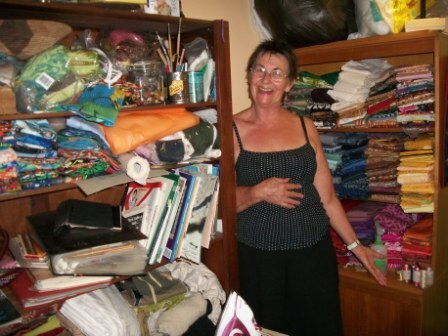 It’s owned by Judith, who has run it for a few years, after Frangipani Fabrics moved to Hobart Tasmania. I’m delighted with this shop, the only one in town, and wish it had been open when I lived here. We have been visiting quilters here, and getting tours of their sewing rooms (and stashes). Alison has a huge collection of Aboriginal-designed fabrics, including some of the really beautiful Tiwi Island Collective fabrics. Her quilts are very Top End, and beautiful, and I got a bit of show and tell when we arrived. She will be doing an exhibit with her friend Mary Noble and a mutual artist friend in October at the Craft Council and they are both working very hard to produce the pieces for this show. Mary had us over for brunch yesterday and showed us around her magnificent garden. 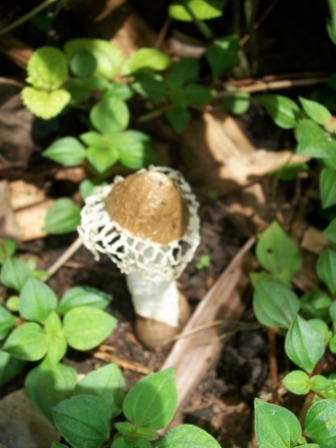 A very strange looking mushroom, called a “phallous fungus” – as you can see, it is well named. 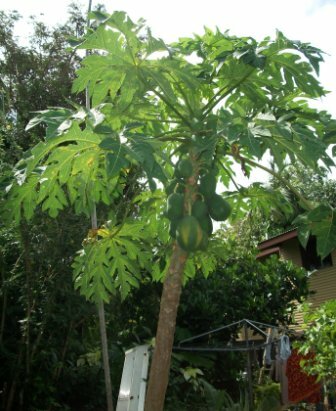 She is also growing pineapples, passionfruit, pumpkins and paw paws (papayas). 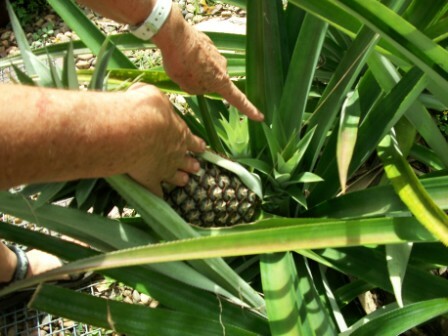 Mary shows me the side shoots of her pineapple. Her garden has benefitted from the nearly 3 metres of rain they’ve received this Wet season. It’s been a whirlwind of social engagements here. 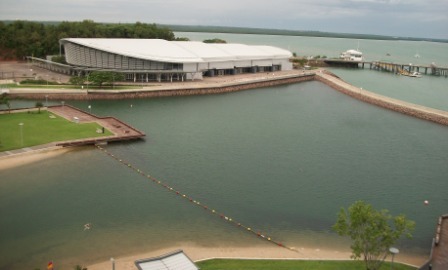 We have very close friends in Darwin and have seen almost all of them, through our various get-togethers. We’ve also been sampling some of the joys of the city. 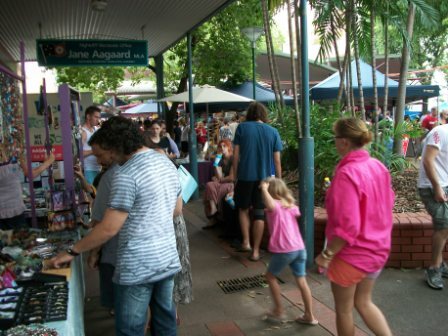 Darwin has a number of regular open-air markets that are very well attended. Mindil Beach Market only runs in the Dry season (which it will be soon), but on weekends in the Wet, you can go to Parap Village Market Saturdays or Nightcliff on Sundays. Yesterday we visited the Nightcliff Market. There are always interesting things to buy: “pot plants” (not the illegal variety, but plants in pots), clothing, palm reading, leather goods, and even some crocodile skulls at one. You should always save yourself for lunch here, because you can sample foods from all over the Asia-Pacific: Vietnamese, Indian, Indonesian, Japanese and Chinese. Our gig last night at the Railway Club in Parap went very well. We did a bit of show and tell, and sang two sets for everyone. Some of the audience had heard the songs from the first CD as I was writing them, and I’m sure they noticed quite a few changes in them over the years. They did some great singing along, too. We finished the show with a song I wrote about the demise of the Hotel Darwin in 2000, called “Grand Old Duchess”. It’s still quite emotional for people to hear this song here. John took this picture of me introducing "Sweaters for Penguins"
Only an adventure could get me out of bed at 7am on the morning after a gig! 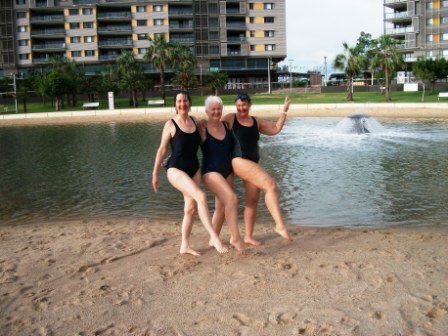 This morning we went swimming down by the new Wharf precinct with Alison and Mary. When we were last here, there were plans to turn the mud flats by the government wharf into condos and a water park. It’s all completed now, and what a difference! There are lots of blocks of units, restaurants, shaded green space, a box jellyfish-free swimming zone, and even a wave pool! We are still prohibited from swimming in the open bay until the end of May, because box jellyfish can be lethal, especially to children, so this area is closed off and supposedly “jellyfish-free”. There was a story on April 1st in the NT News (my favourite rag) about someone swimming in this area and getting “attacked” by a “suckerfish”, whatever that is. Haw haw! Must be an April Fool’s joke, we thought, along with the rest of the dubious stories. (also see: http://www.ntnews.com.au/article/2010/08/12/171421_ntnews.html) So four of us headed out into the murky waters to swim. As we got to the far end, I was the first to be “nudged”. (There’s something spooky about having a fish rub up against you in murky waters – perhaps I have spent too much time watching “Jaws”!) We all got “suckered” by the fish. We all think he was just lonely – there is no outlet to the bay from this area, so perhaps he just thought we were potential mates. That’s a bit creepy too…. We survived the sucker fish, and lived to tell about it! We’re starting to see some sun, and it didn’t rain last night, so perhaps the Dry is coming! We hopped on a plane last Friday for an uneventful trip to Perth – the most remote capital city in the world. We’ve driven this before, on my first trip to Australia in 1998, and were very happy to NOT have to do it again. The Eyre Highway across the Nullabor Desert and the Great Australian Bight were interesting, but the drive doesn’t warrant repeating. Three days of desert, dead kangaroos, and road trains (huge transport trucks with triple trailers), with an occasional diversion to look over the edge of the world. And bush flies….. (surely the most persistent and annoying flies in all the world). 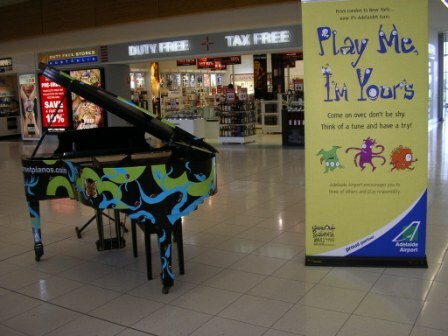 Bringing music to the masses - chopsticks, anyone? Where is Ricky Tims, when you need him? We arrived in Perth a few hours later, having gained 2 1/2 hours in the time change. As soon as the door to the plane opened, we realized we were in a very different climate. When we left Adelaide, it was showery and about 16 C. Perth hasn’t had the benefit of all the rain back east, and it was 36C and bone dry. Out came the shorts, off came the fleece jacket, on came the aircon. Our gig was in Dongara, a 3 1/2 hour drive north, just south of Geraldton, if you’re following us on the map. You will be forgiven if you don’t know it – we’ve been asked by lots of eastern Australians who have never heard of the place. 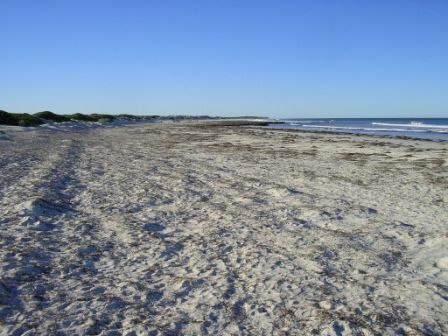 It is on the Indian Ocean, and is populated by retirees and crayfishermen. The retirees largely come from parts north, from mining and agricultural properties. Some of them live in magnificent new houses overlooking the beach, and the lifestyle is definitely relaxed. 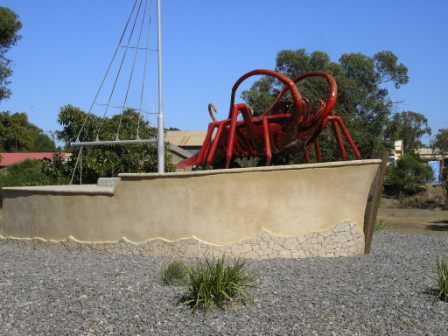 There is a big crayfish at the entrance to town to welcome you. Our hosts for this concert were Sue and Joe, and they also housed us at their former B&B near the edge of town. We had a lovely evening with them, and went to bed early (it being 2 1/2 hours later for us). The concert was the next day at 2pm. Sue said she had almost sold out all the tickets, which was wonderful, and had ladies from Geraldton and parts east driving in for it. People drive more out here, just like us! The day was very eventful, starting with breakfast. Sue collapsed while making breakfast, having suffered a mild stroke and had to be taken to hospital! It was very worrisome, and we tried to be as helpful as we could. We kept up to date with the news as the day progressed, and were extremely happy to see her back at home by the evening, looking and feeling much better. But she was so disappointed to have missed the concert that she had done so much work to make happen! We were well taken care of by the rest of the committee, and had a lovely afternoon, including afternoon tea (which, here in Australia, always includes yummy desserts). Everyone was so welcoming, and I “reckoned” I could live in Dongara, after that! Afterwards, we changed and were treated to a tour of town by Loris, and a “barbie” at her house later. Other guests were Ros and Rob, who entertained us with many hilarious stories of running a property in the north (read: outback). The properties (ranches) here are huge – there is very little rain, and you need large parcels of land to keep enough cattle to make it worth while. The logistics of such a feat are beyond me, but there are many still keeping the tradition going. It sounds like there are some real characters up there! The next morning we were invited to go with some of the gals to swim on the beach. Well, not exactly “swimming”, because there were some big waves coming in from the open ocean. I learned which ones to jump over, which ones to duck under, and which ones to just stand there and let the bubbles give me a massage. They do this every morning for most of the year. The water was warm, and the companionship wonderful. No pictures – my camera doesn’t like water! Then breakfast at the cafe on the beach, a short concert back at the house for Sue, who had missed everything the day before, and we hit the road to return to Perth. I have a lot of wonderful memories from our first trip to Australia, and one of them is the entire drive north from Perth to Darwin. Every day we would drive a long way, but every day there was something wonderful – a rock formation, a beach with shells and dolphins, a camel ride, a helicopter ride. 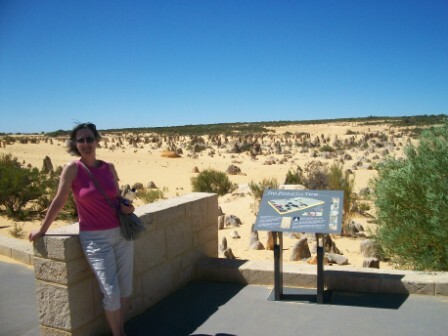 On our way up to Dongara we passed the cutoff to The Pinnacles, at Nambung National Park. We camped near here in 1998, and I was keen to return for some more pictures. 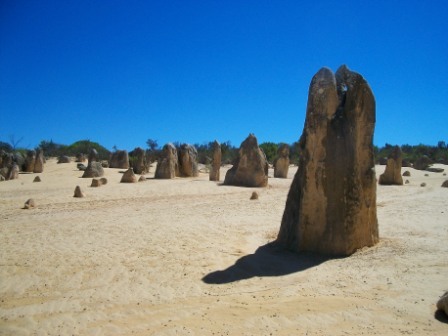 If we were further north in Australia, these limestone pinnacles would remind me of anthills. But here, they are a mystery. They might be calcified tree roots, or actual trees from eons ago, and now the sand has eroded to reveal them. No one knows. They are wonderful, though, nestled in an ochre sand the consistency of cornmeal. They cover a very large area – we drove through them for about 20 minutes. You could take a million photographs of them, at various times of the day, and they would all be wonderful. We hugged the coast after that, on our way back to Perth. Dinner with friends last night in town. We have three more days here to catch up with friends before we fly to Darwin. It’s been a VERY full two days! We continue to send our thoughts to Sue, who will be recovering from her stroke for a while. She’s in good shape, though, all things considered. We hope there are no more similar events on this tour. Last Saturday night we performed in the home of very good friends of ours in North Saanich BC. It was a great evening. Bob and Louise had enticed 38 friends to come out and share the evening of songs, quilts and stories. House concerts are one of my favourite ways to perform. It’s not a new idea, but it is unknown to some people. Classical chamber music, for example, was originally performed in salons of well-to-do patrons of the arts. House concerts are the modern version. They are intimate, relaxed, and there is very little in the way between the performer and the audience. That’s why I love them: they break down that barrier. 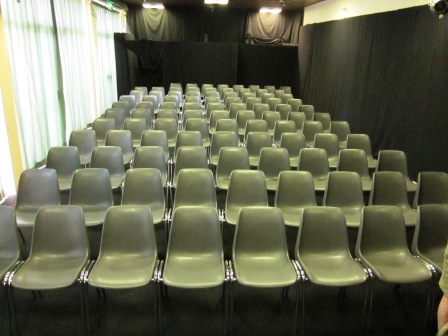 It starts with having a room that is large enough to seat 20-50 people (with chairs, please). Nice acoustics are a bonus, but not essential. Most house concerts are done without additional sound equipment, which makes the set up very easy. Next, have a bunch of friends who like to get together. They don’t have to be all interested in music, but it helps. They could be a quilting group. Sometimes house concerts are advertised publicly, but most often, they exist thanks to personal networks of both the hosts and the artist. The Internet and social networking sites are very handy to publicise the show. House concert hosts are expected to do the promotion for the event, supply yummy nibblies (I have some great recipes, if you need help! ), chairs, information and sometimes drinks (but most often, people bring their own). Sometimes they feed and house the performers as well, especially if they are from out of town. They keep track of reservations so they know when they have at least 20 people and when they can’t fit anyone else in the room. Sometimes, they add a second show, if there is enough interest. Admission is usually $10-20 each. The host will be able to cover costs from that amount – the rest goes to the performer(s). The artist is expected to do two sets of music, with an intermission in between, and generally be charming and approachable. S/he can bring CDs to sell, or other product. Personally, I love being able to do two sets of music, because at quilting guilds I can only do a one-hour set. I have WAAY too many songs that I don’t have time to do in just an hour! The satisfaction factor at house concerts is very high. The audience is more relaxed than at any other venue I can think of, and therefore are more appreciative of the music in this intimate setting. The musicians generally sell more CDs. I must say that not all musicians shine in this circumstance. I think of some performers who don’t relate to their audiences very well, and who LOVE to have that barrier (serious sound equipment, high stage, orchestra pit) between them and their fans. If their stage presence is rude or insulting, they should probably not be invited to perform at a house concert. And the benefit for the hosts? The chance to hang out with their favourite performers in their own home, and to make major points with their friends for having hosted a unique and entertaining party. I think Folk music in Canada is surviving just now thanks partly to house concerts. As normal venues dry up in favour of bands, sports TV or nothing at all, house concerts can keep a career afloat. It’s a great way to build a fan base, and to keep yourself in shape. On Saturday night, we were able to introduce a whole new audience to quilting. Not all the songs were about quilts, but I did bring along quite a few quilts for show and tell, and lots of people were looking at them very closely. 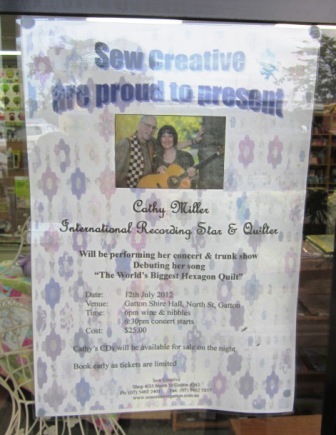 I’m sure Bob and Louise had some talking to do to sell people on the idea of coming to see the “Singing Quilter”!! But once they were there, I think they were very glad to be there. John is planning our next tour to Australia, and we have one house concert booked already. I hope some others want to give this a try. It’s so much fun! The CDs have left the factory! Just a quick note this time. The final part of making a CD is waiting for it to arrive. I have just received notification that 500 of my new CDs are now in a truck, being driven across Canada to Victoria. They should arrive Thursday or Friday this week – IN TIME FOR THE CD LAUNCH!!! (unbelievable). 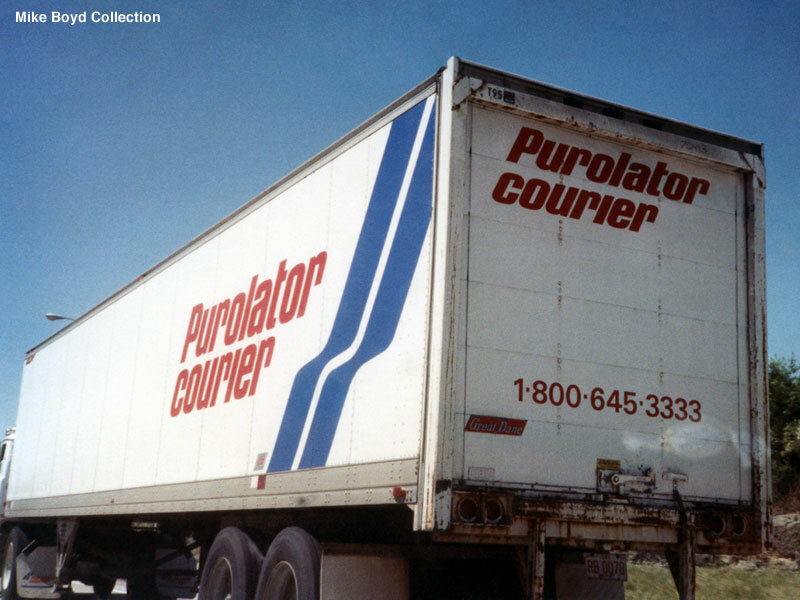 So….. if you are travelling along the Trans Canada highway this week, watch for a very important Purolator truck. Don’t cut it off, nor hold it up in any way. Let him cut in front of you, allow him to make that left hand turn in heavy traffic. Give him a friendly wave, and help him on his way! Please don’t get into a traffic accident ahead of him, so that there are many hours’ wait. Don’t do a rain dance which will bring the torrential downpours that wash out the roads. No hail dances either! Wish for good weather over the windswept Prairies, mountain passes and down towards Vancouver. No high seas across on the ferry, either. Just clear sailing. Wish for quiet motel rooms for the driver, so he is sharp on his travels – no falling asleep at the wheel and drifting off the road! And quick service at the restaurants he stops at along the way. The journey is fraught with potential delays! This might be the very truck that will deliver my CDs! A good place to watch for him is at the Nipigon bridge, just east of Thunder Bay, Ontario. All vehicle traffic in Canada going from one side to the other goes over that bridge, and you could stop Canada in its tracks by interfering with it. PLEASE DON’T UNTIL I GET MY CDS!!! Tomorrow, we’ll send the CD off to be manufactured. It should take three weeks from then, plus some travel time to get the boxes from Ontario to British Columbia. It’s been a busy couple of weeks since we got home from recording. I can’t tell you how excited I am about all this. I’m really happy with how the songs have turned out: the performances, the mixing it all together, and now, the mastering. All of a sudden it sounds TERRIFIC! I hope everyone else will enjoy it too. I’m hoping everyone who listens to it listens first through a set of really good headphones, or on a great set of speakers. It’ll be worth it. From here on in, all energies turn to promotion, so that people find out about it. That will involve lots of emailing, sending the disc to radio stations, magazines, and various people who have helped put it together – including a fan on Facebook who suggested a great line for me to include in “Treat it Right”, as I was writing it! I’ve got the CD “launch” booked for the Satin Moon Quilt shop in October (please let there be CDs to show them then!!! ), and a whole list of emails to send a notification to: people who asked to be notified during the spring tour. We have received the first pre-order for the CD, from England! The info is up on the website now at www.singingquilter.com. I think it’s safe now to tell everyone that it’s there. I’ve been waiting till we get the thing in to manufacturing. Paul will send the files over to the manufacturer tomorrow, and I will take care of the mundane things like – um – paying for it! All is well. Soon, I’ll be back to normal, and will be able to return to quilting. I don’t have to write another song for a while!!! I can plant the winter garden, and clean the house, and dodder around like a normal person again. AFTER the cruise! Next job? PACKING for Alaska!